India has strongly raised with Sri Lanka the concerns over the plight of Tamil fishermen and an interim arrangement is being put in place between fishermen of the two countries to resolve the issue, the government told Rajya Sabha on Monday. Making a statement, External Affairs Minister Sushma Swaraj said the issue of fishermen should not be dealt with on technical grounds but on humanitarian grounds. "Till we move towards deep sea fishing, the issue should not be dealt with on technical grounds but humanitarian grounds. An interim arrangement is being put in place between fishermen of both the countries to resolve the issue," she said. 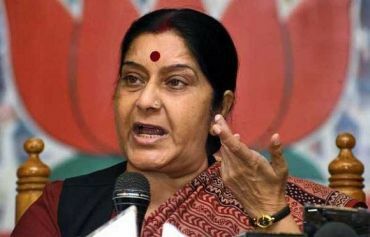 She referred to her visit to Sri Lanka last week and said she strongly raised India's concerns over Sri Lankan Prime Minister R Wickremesinghe's statement comparing the fishermen issue with that of Italian marines. Wickremesinghe, saying the case of Italian marines cannot be compared with that of Tamil fishermen. The Italian marines are not allowing judicial process to start and have raised the jurisdiction issue even before start of judicial proceedings, she said. "I also raised with him that firing on each other's fishermen is not right...I am happy to inform you that on both issues, Sri Lanka was agreeing with us," Swaraj said. "When I raised the issue with him, Wickremesinghe nodded in agreement and said he was not aware of the facts," she said. She said a meeting was slated for March 11, which has now been put off till March 15, after the visit of Prime Minister Narendra Modi's visit to Sri Lanka.